Great Lakes region of North America. 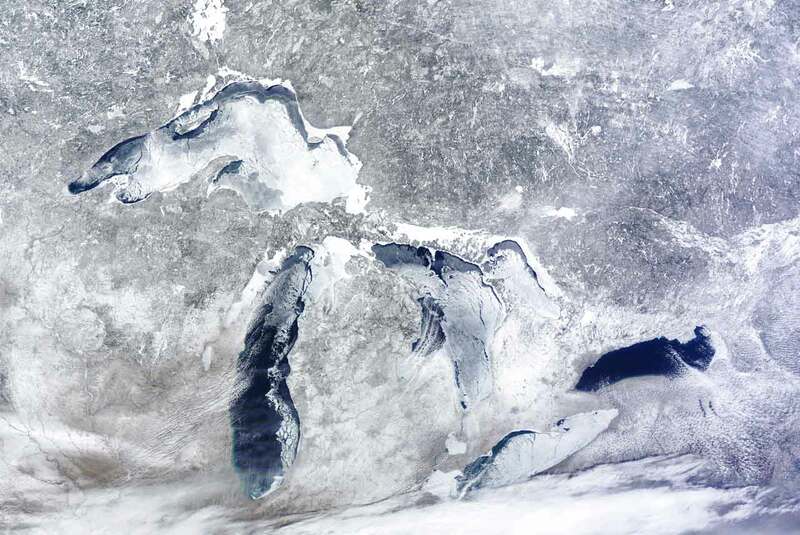 Picture taken by NASA satellite Sunday, March 16, 2014 and provided by NOAA Great Lakes Environmental Research Laboratory. Snow and ice still dominate the landscape and helps to make easily visible hard-to-see features such as the detail along the Ottawa River, the intricate coast of the north channel of Georgian Bay, ice coverage of Lake Erie, snow belt area east of Lake Huron, the ruggedness of the Candian Shield and the thousands of rivers and lakes in northern Ontario and western Quebec. Also visible are the densely urbanized areas of Toronto, Kitchener, London, Windsor and the area around Sudbury denuded of trees. Click the picture to see it larger.